Anneke and I had a busy couple of hours on Mt Albert (not really a mountain more a bit of a hill) this morning. 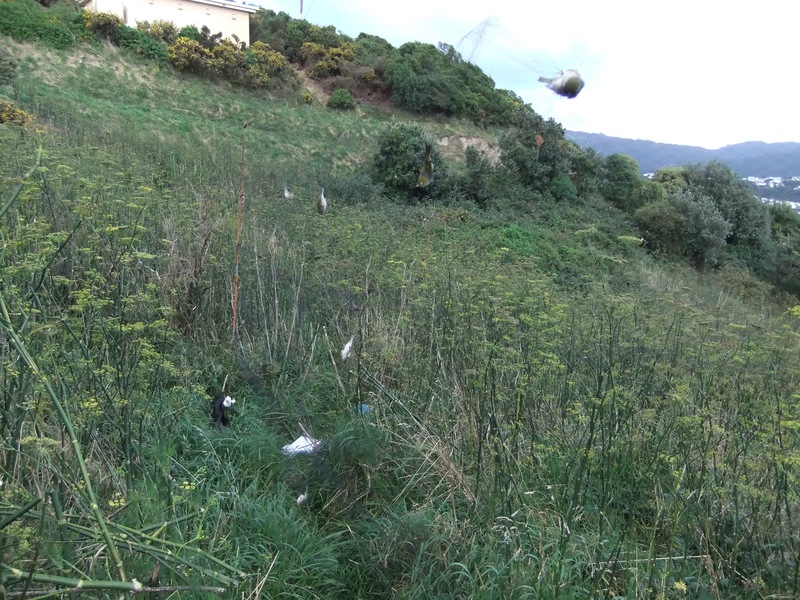 We had a couple of nets up in the fennel patch targeting the early morning flock of Silvereyes. We managed to catch 46 with the only bycatch being 1 Dunnock. All birds were new with no recaptures. Not sure why we do not recapture more at this site. Either their is a huge number of birds or a big turn over, might work it out one day. 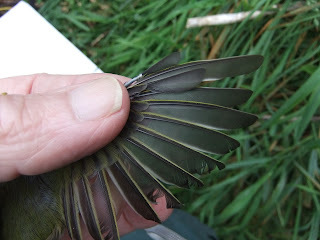 Like the Sparrows yesterday some of the Silvereyes are moulting primaries out of sequence. When walking back home through Berhampore Anneke had the good fortune to watch a Falcon hassling a Harrier, a most unusual sight over suburban houses. Ros, Bernard and I had a very successful mornings banding at Island Bay yesterday morning. In absolutely perfect conditions we caught a total of 109 birds of 8 species with 100 new and 9 recaptures. As expected the tally included a big number of House Sparrows but that number was even larger than I had anticipated. Dunnock – 1 (0) as has been the pattern this year a lot less than in previous years. House Sparrow – 83 (5) All the Sparrows are now well into moult with a few having finished. 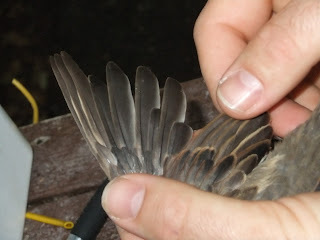 Several were moulting primaries out of sequence. All in all a very busy morning. 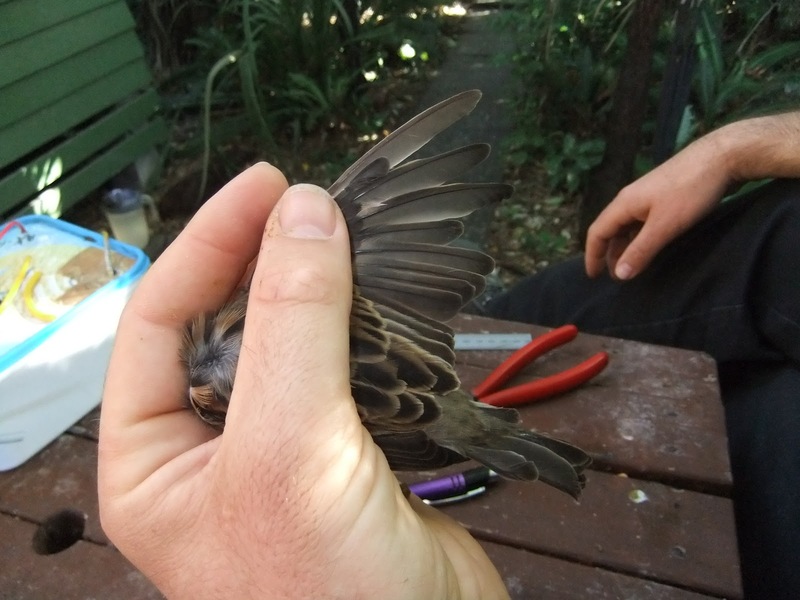 Had an interesting recovery reported this week with an e-mail from Colin M at Te Papa wanting to know the age of a House Sparrow that had been handed in to them back in January. The bird had been spotted dead on the road by a 3 year old boy and his mother had taken it into Te Papa's bird people. The bird had been banded at the Zoo back in June 2004 and is now the oldest Sparrow we have recaptured or recovered at any site, so great spotting for a youngster. ﻿﻿They kept me busy for the next hour delaying getting a second net up. Between 7.30 and 9 when the sun came onto the nets and the birds disappeared I caught 36 Silvereyes with 35 new but only 1 recapture. As well as the Dunnock also caught 1 Grey Warbler. 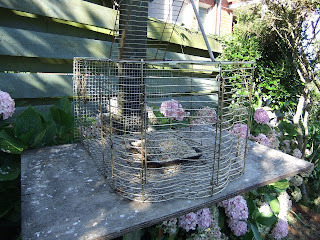 Set the trap at Bridie's for a couple of hours Friday afternoon. Although they are getting pretty wary did managed to catch 13 House Sparrows with 10 new and 3 recaps. With several birds now caught several times starting to build up some good stats on their moult. 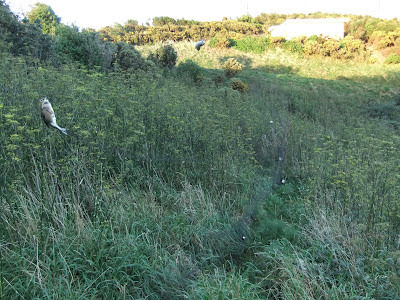 If this patch of bad weather stops (I think it has been going on all summer/autumn) might manage some mist netting next week. Have had several sessions catching mostly House Sparrows at the two Hornsey Rd sites in the last week. Mostly at Bridie's down the road but also some here. Most birds were caught in traps but a 6m net set up on Bridie's lawn made a number of recaptures. Greenfinch - 0 (1) a bird banded at the Zoo in 2008. The trap in use at Bridie's is made from an old Canary cage which has been modified so it can be used either as a funnel trap or a pull the string and shut the door kind, looks a bit odd but is affective. There is unlikely to be any postings for a couple of weeks as I am off for a stint in hospital. With overnight rain forecast I had a quick session late afternoon at the Houghton Bay stream. In just over an hour caught 15 birds of 4 species with 12 new and 3 recaptures.